Over the years, I have photographed lions from every angle and situation I can imagine. Lion sleeping. Lions hunting. Lions fighting. Lions f***ing. Lions sleeping some more. But I’m almost always working from the safety of a four wheel drive safari truck. It’s not just because I’m scared silly of the things. Though maybe I am a little. But lions are for the most part scared silly of us as well. Throughout their recent generational memory, nearly all of their encounters with humans on foot have been nasty. It’s counterintuitive, but lions don’t really mind stinking, noisy safari trucks. But a man on foot will 9 times out of 10 send them packing in a hurry. It’s not a theory I feel any particular need to test of course. No sense finding myself the 10th out of 10. But I’m always trying to find a chance to shoot something a little different. I spotted a lion pride in the early morning, feeding on a wildebeest kill. Once they’d had their fill, several of the cubs began to race after each other, playing boisterously. The idea came to me in a second, before I though too hard about what I was going to tell the insurance lady, I put out my tripod with a camera, wide-angle lens and radio remote, and then backed the truck away. Lions are innately curious creatures, and the cubs immediately began stalking up to it. The first few times the camera clicked, they started a bit. But they grew bold quickly, and began to lick and chew on the camera. They were part of a large pride of lions, an extended family. And as with all families, they had different personalities. Most of the cubs were young and full of beans. The adult females, their mothers, were more reserved, cautious and dignified. Eventually one was attracted by all the fuss around my camera, and stalked over very, very slowly to investigate. She was clearly uncertain about the camera, and tried to sneak up behind it. I was surprised when she took a hard swipe at the tripod, but managed to get a picture just as she made contact. 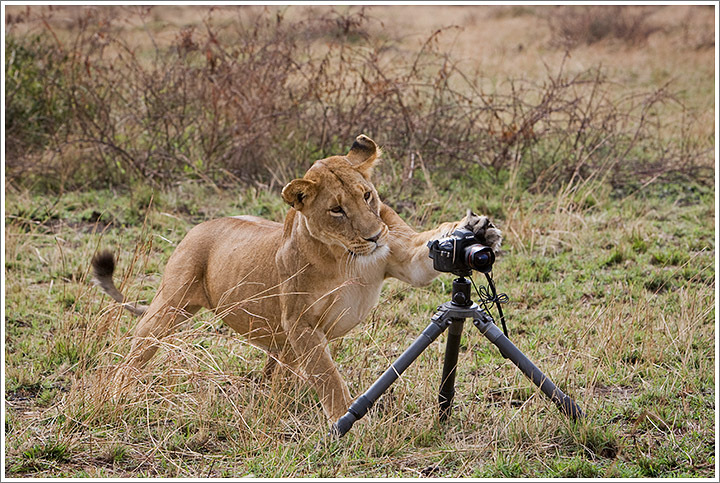 I thought it was all pretty funny until she grabbed the camera and tripod and took off at a dead run across the savanna. I was dumbstruck and sputtering before giving give chase in my truck until she finally dropped everything, lens down, into a mud hole. The lens was filthy and the camera had a big bite mark on the back. Totally out of commission, but at least the card wasn’t damaged so I got my pictures back. When I got back home, I did send the camera in to the shop, with a big “Lion Damage” on the repair order. Photographed September 26, 2009 in the Masai Mara Game Reserve using a Canon 5D and 70-200mm lens. This entry was posted on Sunday, November 27th, 2011 at 6:29 pm. It is filed under Gear and tagged with Africa, Kenya, Lions, Masai Mara, Wildlife. You can follow any responses to this entry through the RSS 2.0 feed.